The first challenge with Namu is its location. If you haven’t been here before, it lies in an odd little strip facing 15/501 right on the Durham-Chapel Hill line. Head up on Mt. Moriah Road, turn into New Hope Commons Drive and then take a left into a nondescript gravel lot. Namu sits on the western side of the lot facing the highway, phew! They’ve got some signage up front but there are several buildings in the area and it’s a bit confusing coming in from this side. Inside, things get better quickly. They’ve got a white and bright coffee bar area with counter seating that’s bright and cheerful. 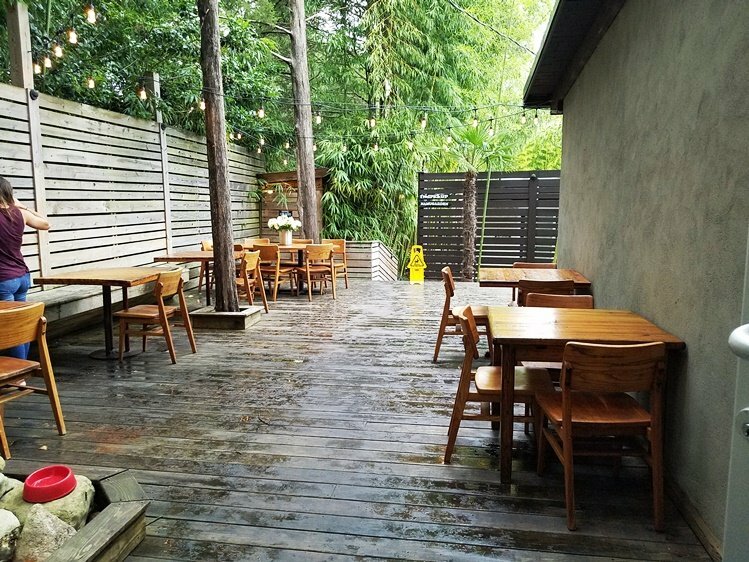 To the back, a rustic patio set in some trees and to the right, a couple of modern dining rooms with exposed beams, blown glass lighting and a lounge area. There’s a lot of space here to stretch out in, have a meal or linger over coffee. The architecture and design of Namu feels a bit like an Asian teahouse with its bamboo garden in back! 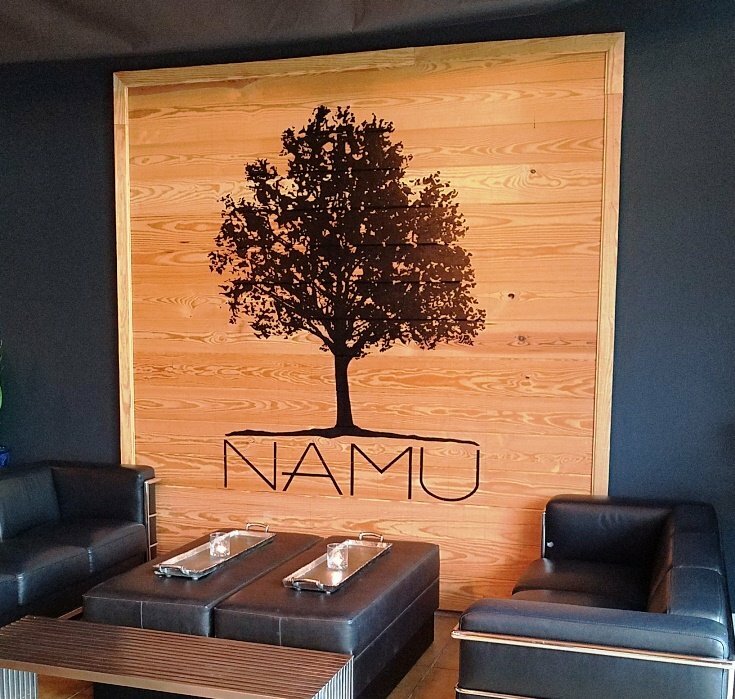 Namu is counter order, table service with a list of small plates (han saang) and full entrees ranging from Korean barbeque plates, burrito bowls and tacos from $5 to $13. 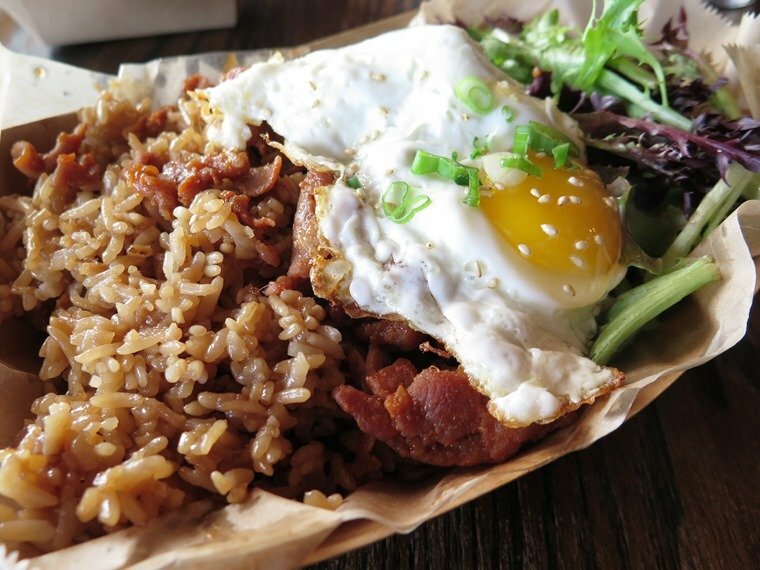 Beef bulkogi and an egg are $1 extras on the menu, I recognize a lot of items from the Bo’s Kitchen food truck which I reviewed a while back. 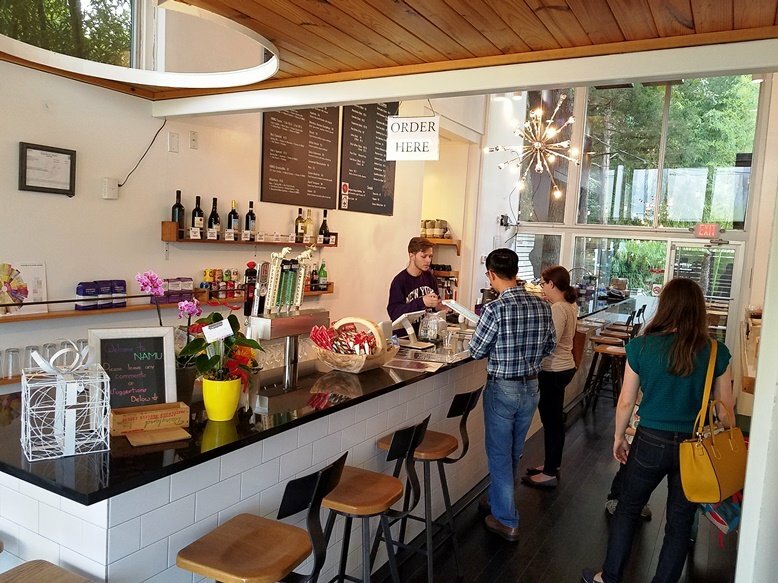 A full coffee bar will get your day going with some caffeine and they’ve got some sweets sourced from partner food trucks (waffles, cake). Namu also has a good selection of wines and beers to enjoy with your meal instead of coffee. After you order, you’re given a number on a stand and go find a seat in the dining room. 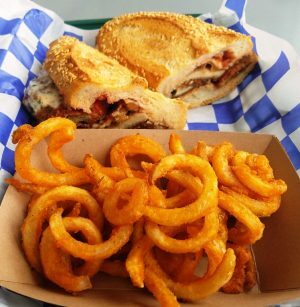 Your eats will be brought out to you when ready. 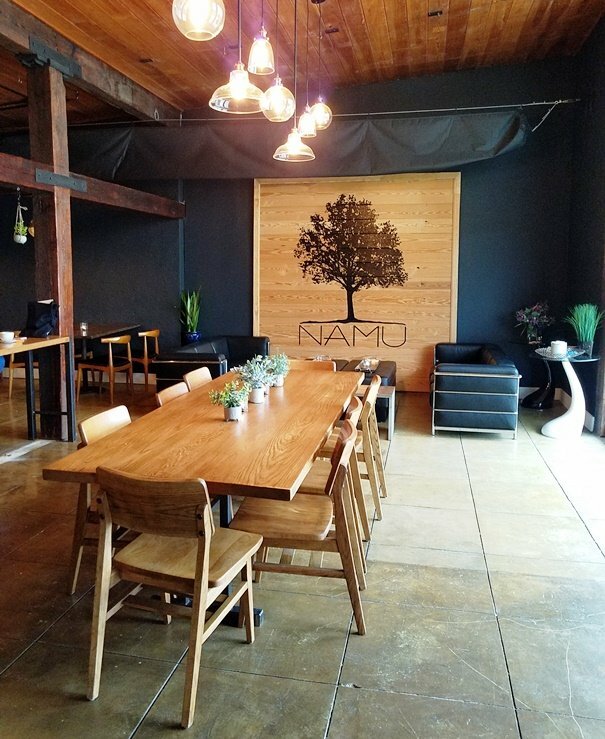 Hanging out in Namu’s dining room, you’ll be entertained by some electronic dance music and Korean pop while you wait. When I’ve visited, it seems like a pretty young college crowd. It’s a good looking space with some Asian aesthetics and plenty of sunlight. A corner lounge and couch area shows off a beautiful wood inlay Namu sign (namu = tree in Korean). And the furniture gives a nod to their Korean origins with curved seat backs. In the dining room you’ll also find a self-service area for plastic utensils, chopsticks, napkins and sauces-condiments, very much like you would at a food truck. 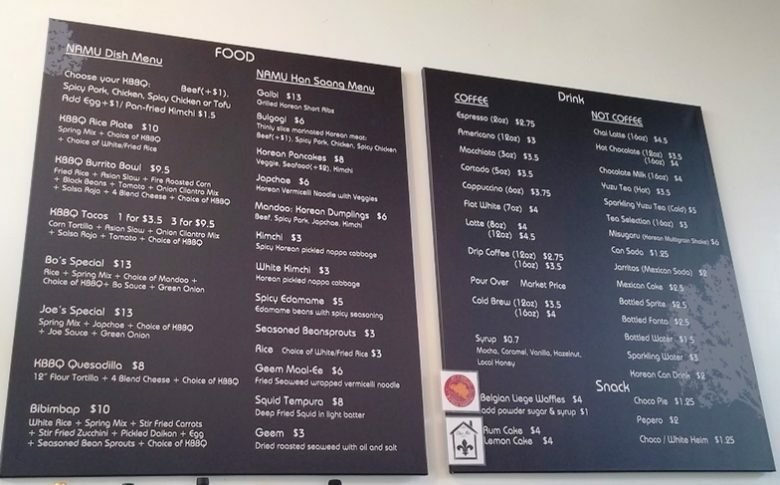 Over the course of my visits, I’ve had a good chance to sample a lot of Namu’s menu. 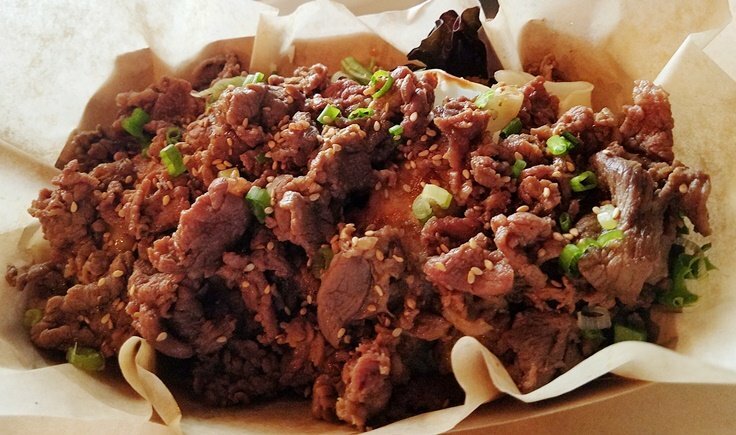 Most of the dishes are served in paper containers, the Bo’s Special is a good pile of bulkogi beef with scallions and sesame seed on top. Digging in further I find the rice, greens and four spicy pork mandu underneath, alright! The bulkogi at Namu is excellent: tender, hint of sweet and perfectly done. I also love the mandu which is a wrapped, pan-fried dumpling stuffed with slightly spicy pork (hidden in picture). There’s plenty to eat here and it’s really good Korean eats. A return visit allows me to explore the menu a bit more. I order up a spicy pork rice plate along with the galbi (short rib). And all the food is outstanding! The spicy pork is tender and perfectly marinated with a slightly spicy sauce (gochujang?) and love the fried rice on the side which shows off some toothsome stickiness. Add in the perfectly fried egg on top and it’s a wonderful meal. 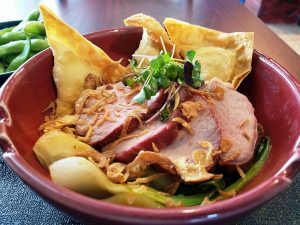 A side of greens makes for a great complement. And the galbi? OMG, loved this plate. While it’s the most expensive dish at Namu, if you love beef you have to get it! 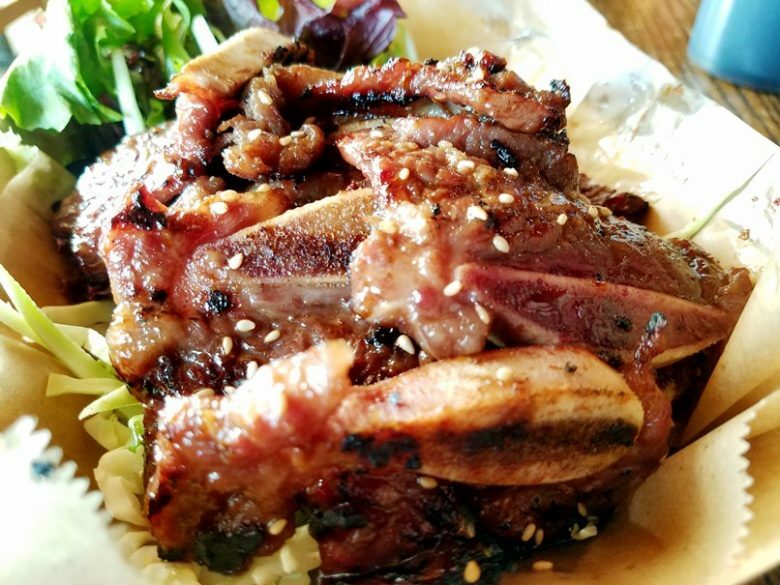 Cross-cut ribs grilled and marinated with a slightly sweet, soy-sesame sauce. These ribs were super tender and showed off that perfect charring flavor of the grill. Sinewy and a bit chewy, wonderfully delicious.